Anyone who played computer games in the late 80’s or early 90’s should instantly recognize this classic city building game. SimCity was originally released on the DOS PC, Mac, Amiga, Commodore 64, and Atari ST, and arguably launched a whole new genre of video games. As the mayor/city planner, you lay out roads, rails and power lines, as well as zone land for residential, commercial or industrial use according to demand in order to stimulate as much growth as possible. There are no clearly defined parameters for winning or losing, and each game played does not have an end point, meaning that you can tweak your city indefinitely. Adding to the challenge are random disasters after which you must repair the damaged portions of your city. Here in the United States, the only console to which SimCity was ported was the Super Nintendo. This version of the game features rich, colorful graphics and several enhancements over the ubiquitous PC version that make it feel more like “SimCity 1.5”. As each year progresses through its various seasons, the color scheme of the game changes as well; from bright colors and green grass and trees, to brown tones, and finally to a white-out of Winter snow. As your city grows, you are granted bonus buildings including libraries, amusement parks, casinos, libraries and zoos. On the 50th anniversary of the founding of your city, you are given a water fountain, and once you reach a population of 500,000, you are given a statue of Mario. The game does have two notable drawbacks; the lack of compatibility with the SNES mouse and a slow pace (in comparison to the computer versions) on even the highest speed setting. The SNES mouse wasn’t released until 1992 so support for the device was never an option, but there is no reason for game time to progress so slowly. 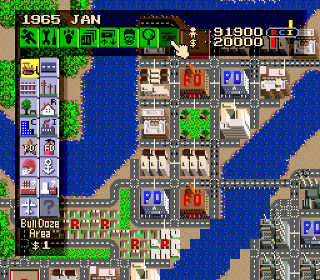 Nevertheless, this is definitely one of the best versions of the original SimCity. While it doesn’t have the complexity of subsequent SimCity titles, it takes the simple formula of the original and adds enough new content to make it a worthy upgrade. Buy SimCity on GameGavel or Amazon. Tagged Maxis, Review, Sim City, SimCity, Simulation, SNES, Super Nintendo. Bookmark the permalink.